Complette COM interface to Windows NT/2000/XP local or domain account database. Protector Plus is an anti-virus software designed for Windows NT/2000/XP. DameWare NT Utilities (DNTU) is an enterprise system management application for Windows NT/2000/XP/2003/Vista. DNTU provides an integrated collection of Microsoft Windows NT administration utilities. Reset, replace or recover Windows NT, 2000, XP, 2003 and 2008 Server, and Windows Vista passwords instantly by booting from the supplied Boot CD. Recover forgotten administrator passwords or assign administrative privileges to any user account. Change Logon Background for Windows Vista or Windows 7 and Login to your Computer with your favourite background or Screen Image. Automatically monitor your Windows Nt/2000/XP event logs. Detect security compromises and hard- or software failures before they hurt. 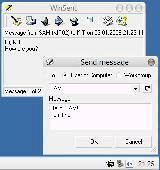 Integrates Windows systems in UNIX based management systems. EventReporter continously monitors the Windows Event Logs and forwards new events to either an email recipient or a syslog server. PresenTense Time Client is a network time client for Windows NT/2000/XP/2003/Vista. Allows you to inspect a state differentservices of Windows NT/2000 from batch files and To react to the arisen problems by any friendfor you by a way. Cetus StormWindow [TM] for Windows NT will allow the authorized user to add several types and degrees of protections to the desktop and system of a Windows NT computer. Advanced NT Security Explorer (ANTExp) is an application for Microsoft Windows NT, Windows 2000 and Windows XP system administrators for finding holes in system security. EventTracker provides a centralized, scalable, enterprise class solution for real-time event log management, analysis and reporting for Windows NT/ 2000 / XP.